A routine part of a dental check up is getting x-rays. 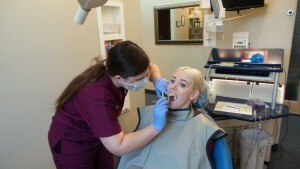 Some may wonder if the dental x-ray is really a safe option and if they should have them done. Let’s take a look at what the experts say about having x-rays taken when you are at the dentists office. Why is a dental x-ray taken? X-ray images of the teeth are a great way for the dentist to see any problems with the teeth. These images help them to see inside of the mouth with greater detail. X-rays show the oral tissue, bones and teeth in a way the dentist cannot see with the naked eye. They are a great tool to see the roots of the teeth, check for cavities, and see the growth of teeth that have not yet emerged. Does an x-ray give off radiation? Yes, it does however the amount is so small it’s almost insignificant. In fact, just walking around the earth we are all exposed to radiation from the sun every day. Other equipment like CT scans and regular x-rays give off much more radiation. The dental x-ray gives off one of the smallest amounts of radiation than any other device. The amount of radiation exposure from one set of x-rays can be compared to that of flying on an airplane for a short 1 – 2 hour flight. The American Dental Association recommends a patient work with their dentist in order to form a personalized x-ray plan. Some patients will not need x-rays often if they have healthy teeth. Working closely with your dentist will ensure that you are getting the best care while weighing the benefits and risks. What can I do to protect myself from radiation? The dental assistant that takes the x-rays has been trained and certified. They know what to do to protect the patient and themselves. There are also regulations set in place for equipment to ensure safety. Patients will wear a protective vest during an oral x-ray to protect their body from radiation exposure. Don’t hesitate to express your concerns to your doctor or the dental assistant. Their priority is your safety, and they can talk you through all of the safety measures that are in place. The benefits of having a dental x-ray done most often outweigh the risks. They can be a great preventative tool to help keep your mouth healthy.